More than 100 protesters were arrested in New York City Wednesday amid rallies to call for justice in the death of Freddie Gray, the Baltimore man who died in police custody after suffering serious spinal injuries, sparking violent protests across the Maryland city, police say. Several hundred people gathered for the Baltimore unity rally in Union Square before starting to march Wednesday evening. They split into different groups marching in different directions, picking up more demonstrators along the way and growing to a total of about 1,000 or more. They held signs that read "Black lives matter," "I can't breathe," "RIP Freddie Gray" and "Is life a white privilege?" Around a dozen protesters were arrested in New York City for blocking the streets during a Baltimore unity rally near Union Square Wednesday evening. This video shows the same arrest scene from the ground and from Chopper 4. 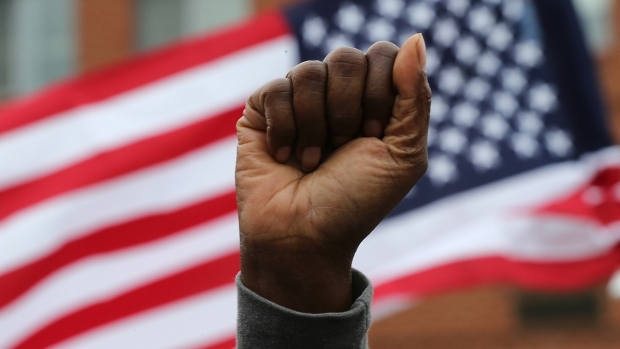 Organizers had urged various activist groups to rally at Union Square "to show the people of Baltimore that we stand in solidarity with them and with their resistance because their resistance is for justice and their justice is our justice," according to one news release. At the start of the march, more than a dozen protesters were arrested near Union Square after they blocked the street. Police with batons had to push the crowd back onto the sidewalk. Several smaller clashes between demonstrators and police broke out along the march routes afterward, but there were no immediate reports of violence or serious injuries. A line of police stood in front of the entrance to the outbound side of the Holland Tunnel, preventing protesters from marching in, Chopper 4 showed at about 8:30 p.m. Police cleared the tunnel shortly afterward, reopening it back to traffic. A group of people ended up at Times Square later in the night stood with their arms linked, facing a line of police officers at they chanted "New York is Baltimore, and Baltimore is New York." A skirmish broke out when a protester tried to push past police and onto the street where vehicular traffic was moving. Police took at least one person into custody. The demonstrations were being held simultaneously with the ones in Baltimore, which were also mostly peaceful compared to the violent rioting that rocked the city the day of Gray's funeral Monday. Police briefly blocked the outbound side of the Holland Tunnel to protesters Wednesday evening. It was reopened shortly afterward. Umaara Elliott, one of the New York rally organizers, said she encouraged the message protesters in Baltimore were trying to send. "Anger can be justified. I don't think that public property should be more important than bodies, than the fact that 80 percent of Freddie Gray's was severed. I don't think that a CVS should be more important than his spine and the fact that his family won't be able to see him again," she said, referring to the drugstore that was looted and burned Monday in Baltimore. Freddie Gray ran from officers on bicycles at Baltimore’s Gilmor Homes on April 12 near where he lived. He surrendered without a struggle when officers caught up with him, police said. His arrest was recorded on a cell phone video, which showed him limp as he was dragged into a police van. Gray died a week later, the latest black man to be fatally injured while under arrest. The protest in New York Wednesday was reminiscent of the the ones that followed a Staten Island grand jury decision's last December not to indict an NYPD officer in the chokehold death of Eric Garner. The decision sparked days of protests across the city, mostly peaceful if disruptive. While hundreds were arrested on charges like disorderly conduct, there was very little vandalism and violence, save for an attack on two NYPD officers during a march on the Brooklyn Bridge on Dec. 13.